There are plenty of heroes in the Harry Potter series. Some of them are well known some are completely unsung. Sure, he fought Voldemort with only a mother's love when he was only a year old later but the heroic feats we know and love would not have occurred without the wonderful Hogwarts staff. 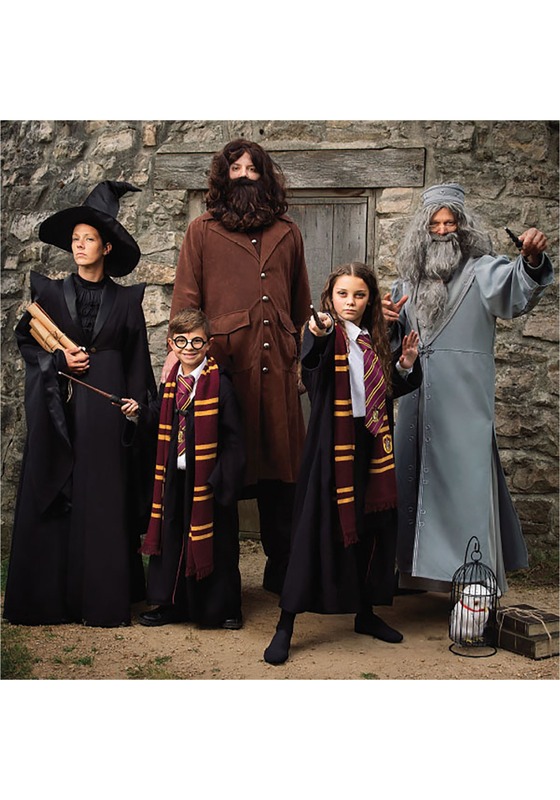 The teachers of the Wizarding World really know how to light that fire for learning in their students! While there are plenty of memorable professors at Hogwarts, none are as smart and respectable yet open minded as Professor McGonagall. She is someone no one wants to mess with. She's got a strict persona, an eagle's eye, and a sharp tongue. She has her weaknesses, sure. She'll pull some major strings when it comes to a strong Gryffindor Quidditch team for instance. Harry expected the horrible Hogwarts ax after Minerva caught him flying a broom underage but after she saw his skills she sent him straight to the Quidditch captain rather than the headmaster. Her dark robes and traditional hat hide a secret wit and girlish desire to see her house in first place at all times! If you're a Gryffindor fan till the end then you'll make a great McGonagall! This deluxe costume features a rich black robe with smart details. The floor length robe has a deep, collared V-neck over ruched, silky black fabric. It secures under the neck with gold button loop. The sleeves are dramatic, forming to a point at the shoulders and flaring at the wrist with a leathery finish. 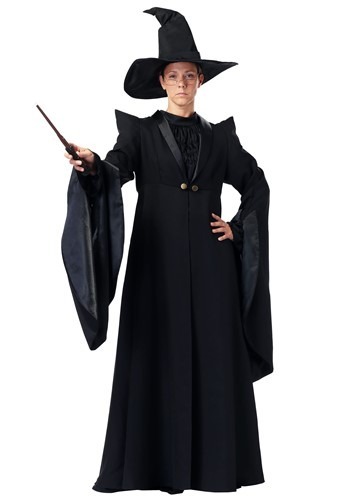 This Halloween, you'll love wearing this powerful McGonagall ensemble. You may have graduated Hogwarts with honors but that doesn't mean you have to leave. In fact, we're delighted you've decided to stay, ten points for Gryffindor!